You may not think of Robin Hood as a Christmas story, but this joyously realised version by Richard Hurford, with infectious Rap, Salsa and Reggae tunes by Rob Castell sends you out into Peckham afterwards humming the music and full of goodwill to all men, women and, in particular, the forty or so children of the cast, product of the venue’s own theatre school. This is the first production under incoming Artistic Director Suzann McLean (who also directs) and the perfect choice for this 30-year-old theatre’s mix of local talent and professionals. 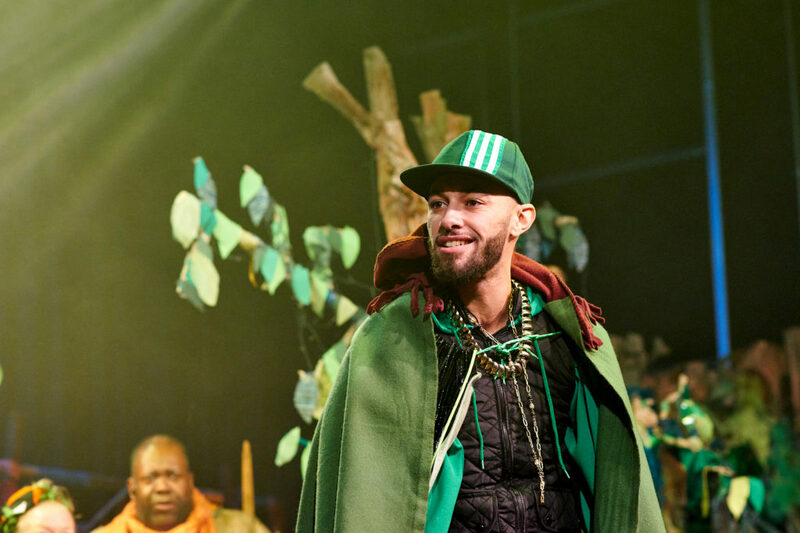 The play’s twist of making Robin himself (academy alumni Malachi Green) so loveably hopeless means that all heroism and resolve for feeding the villagers and taking on the sadistic Sheriff of Nottingham (played with vulpine wit by Ray Newe) falls on the reluctant shoulders of Maid Marian (Ayanna Christie-Brown). Actually, this feels less like gender politics, more a hilarious reflection on modern life, with all these young inhabitants of Peckham growing up with no shortage of disappointing heroes. As the press release says, this Robin is real. In any case, he eventually faces his fears and we realise that figureheads are different to heroes and maybe communities need both. As is traditional with Christmas shows, there is something for everyone, but it’s a nice change that the jokes for grown-ups are clever references, such as those to the ‘me too’ movement and austerity rather than the brash innuendos of pantomimes. Indeed, the production design as a whole foregoes glitz and noise for fun and charm. Instead of satin, sequins and extravagant headdresses, Designer Lily Faith Knight uses recycled materials; trees are made with corrugated cardboard and costumes gleaned from local charity shops, giving a retro impression which, when paired with the funky homemade music, recalls 70s rock musicals and Sesame Street in the time of Children’s Television Workshop. As for performances, the irresistible feelgood factor ensures that the accomplished talents are loved, the less accomplished ones loved even more. The youngsters include some precocious talents, some surely destined to follow previous student John Boyega into a starry future. Others simply love inhabiting their parts – in this show every character has a name, no one’s just a villager! Of the grown-ups, Guy of Gisborne is portrayed with fun, energy and skill by debutante Gustavo Navarro, Friar Tuck played with aplomb and grumpy precision by Geoff Aymer. As Maid Marian, Ayanna Christie-Brown is tough, humble, yet full of bright-eyed optimism even while having to do everything herself, including delivering some magical musical moments in an effortless and soulful singing voice. But as in every community, everyone fits in and plays their vital part. That’s the theme of this version of Robin Hood, but also of this production and of Theatre Peckham itself. And if it’s not a Christmassy theme, that’s Christmas’s problem.